During Wallpeople San Juan 2013 we got to talk to several interesting people that were key to the event's success. This second interview is with Juan Alberto Negroni the coordinator of Wallpeople San Juan. In your point of view, what has been the public's response to the project? How does it compare to past editions? It has worked well; it even started earlier than I had predicted although the reception to the initiative has been very similar to past editions. People responded to the Wallpeople Facebook page, sent messages, and kept in contact. We have the support from Marta Mabel of the PROA (Program for Assistance to the Artist of the Puerto Rico Museum of Art). This year the topic is Music. The first year we did it the topic was "handmade", the year before was "photography" and the year earlier was "art for happiness". In this edition the artwork is based on "Music": artists, genres or even a particular song... anything related to music. Are you expecting a greater reception from the artist sector here in Puerto Rico? There were promises from artists that are going to participate; we have had a few here already but we are waiting on other artists to arrive. A lot of students from the Art League have participated since early in the morning. There have been people that arrived early and have been waiting. Will you continue the project? The event takes a lot of energy and time of planning to accomplish. I think that what is key for the next event is to keep making connections and building contacts, as well as forge commitments to the event with more people even before we know the actual date or topic of the event. Are you working with another alternative or mechanism on the web in which you could expand the connections and have a greater reach for the project? Yes. Aside from i am satos™ Journal, I have TOST FILMS which is a new group that is documenting through video events related to art, urbanism and anything to do with contemporary art. If you had to describe the project with a song or an artist, which would it be? For me it would be Yellow Submarine and all that The Beatles imply. They are unavoidable because they are fun and enjoyable: everything related to the movie, the colours. Their music at that time for me it's genius. ¿Cuál ha sido la respuesta del público al proyecto desde tu punto de vista? ¿Cómo se ha ido materializando el mismo a la luz de las pasadas ediciones? Ha funcionado bien. Yo pensé que a esta hora todavía no iba a estar corriendo, pero arrancó antes de lo previsto. La acogida a la iniciativa ha sido bastante parecida a las pasadas ediciones. La gente respondió al Facebook de Wallpeople, envió mensajes, se mantuvieron en contacto. Contamos con el apoyo de Marta Mabel en PROA. Este año el tema es la música, el año anterior fue “handmade”, el anterior a ese fue la fotografía, y el anterior fue el arte para la felicidad. Y ahora son obras basadas en música, artistas, géneros en particular o hasta una canción. Cualquier cosa que tuviera que ver con música. ¿Se espera una mayor acogida del sector artístico acá en Puerto Rico? Hubo promesa de muchos artistas que iban a participar. Ya han venido unos cuantos; estamos esperando a ver quién más llega. Muchos estudiantes de la misma Liga de Arte han participado desde temprano en la mañana. Hay personas que han estado esperando desde temprano en la mañana. ¿Esperas poder seguir llevando el proyecto acabo? Pues mira, el evento absorbe mucha energía y tiempo de planificación. Yo creo que lo importante para el próximo evento va a ser ir haciendo contactos y comprometiendo a más personas con el evento desde mucho antes que tengamos la fecha y el tema. ¿Estás trabajando con alguna otra alternativa o mecanismo a través de web con la cual puedas conectar el proyecto y que abarque aún más? 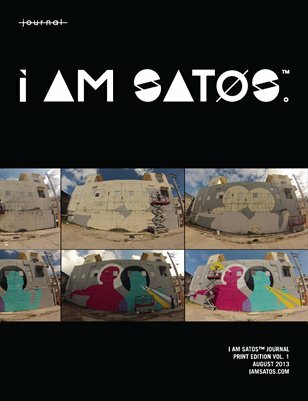 Pues aparte de i am satos™ Journal tengo a TOST FILMS que es un grupo nuevo que se han dedicado a documentar y a hacer videos de eventos relacionados al arte, urbanismo y todo lo que tiene que ver con arte contemporáneo. Si tuvieras que describir el proyecto con una canción o un artista, ¿cuál sería? Para mí sería Yellow Submarine y lo que implica los Beatles: son ineludibles por lo divertido, todo lo que tiene que ver con la película, los colores. Para mí es genial escuchar la música de ellos en esa época. Tomorrow don't miss our interview with Mario Ramírez of TOST FILMS. Tagged with Interview, Puerto Rico, Art, Wallpeople. June 11, 2013 by Mariana Ortiz-Reyes.